Organizations giving less to the cause they claim to donate. The American Red Cross – President and CEO Marsha J Evan’s Salary was $651,957 plus expenses. March of Dimes – It is called the March of Dimes because Only a dime for every $1 dollar is given to the needy. The United Way – President Brian Gallagher receives a $375,000 base salary along with numerous expense benefits. UNICEF – CEO Caryl M Stern Receives $1,2000,000 per year (100k Per month) plus expenses including a Rolls Royce, less than 5 cents of your donated dollar goes to the cause. Goodwill – CEO and owner Mark Curran profits $2.3 million a year. Goodwill is a very catchy name for his business. You donate to his business and he then sells the items for PROFIT. He pays nothing for his products and he pays is workers minimum wage. $0 goes to help anyone. Are you looking for a place to eat in the Pasadena area on Christmas Day? This is a list in progress, which we will update based on restaurants open. If you have a restaurant you would like added please let us know with a comment below. If you see a location below which is not open on Christmas let us know as well. Is having a grand reopening. Only at Gyu-Kaku Southern California locations. 200+ Groupon deals are on sale for only $5 (down from regular prices of up to $90 or more). Including jewelry, wall art, photo books, and more. To celebrate the “Day of the Dozens” (12/12), Krispy Kreme is offering a buy one dozen, get one dozen free Original Glazed Doughnuts promotion. This offer is available Saturday, 12/12 only. Must present coupon with barcode. Celebrate 12-12-15 internationally in the following participating countries. The offer varies by location. Participating countries include: Dominican Republic, Korea, Malaysia, Mexico, Philippines, Russia, United Kingdom, Taiwan, India, Thailand, Saudi Arabia, and Colombia. Not valid in Puerto Rico. Our Los Angeles Fair kicks off this weekend in Grand Park! On December 12−13 from 10 a.m. to 5 p.m. you can shop for the perfect handmade gift, take part in DIY workshops, eat, drink, and be merry! If you’re in the market for holiday gifts, we’ve got you covered with 300 makers showcasing perfect and unique options for friends and family. 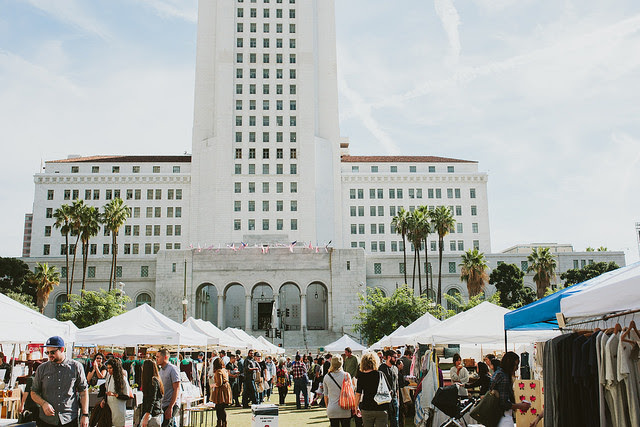 The Fair will take place at the centrally located Grand Park, and makers will set up shop amid the trees in revitalized DTLA across the steps from City Hall. Shop for ceramics, apothecary, home decor, leather goods, furniture, stationery, footwear, apparel, art prints, and more. All items featured in the Fair are handmade by emerging and established makers, and they provide plenty of opportunity to support the growing handmade economy. The sounds and tastes of the holidays will also surround shoppers as they browse the array of gifts. Community radio station KXLU will be on hand with all kinds of music from indie rock to jazz to surf to holiday hits. Come hungry as a swarm of local food trucks offer up tasty treats like gourmet ice cream, Japanese fusion, Indian street food, Argentine fare, Korean-inspired dishes, Vietnamese food, BBQ, sliders, and grilled cheese. Pre-packaged artisanal offerings such as S’mores, relishes, seasonings, pickles, marshmallows, and coffee also make excellent holiday gifts! Getting There: The Fair will be held outdoors at Grand Park (200 N Spring St.), off of Broadway and across from the steps of City Hall. You can view a map of the area here, and get directions here. Visitors are encouraged to walk, bike, or take public transportation to the Fair. Uber is sponsoring rides for our Holiday Fairs. New users can get up to $20 off their first Uber rides using the code RCF2015. To sign up, download the app or visit uber.com/go/RCF2015. There are several paid parking lots in the area, but parking is limited. The closest Metro stop to Grand Park is the Civic Center/Grand Park stop on the Red or Purple lines. Your leashed pets are allowed to join in on the fun! Want to spread the word? Join our Facebook event and invite your friends. Grab our e-flyer and pass it around. 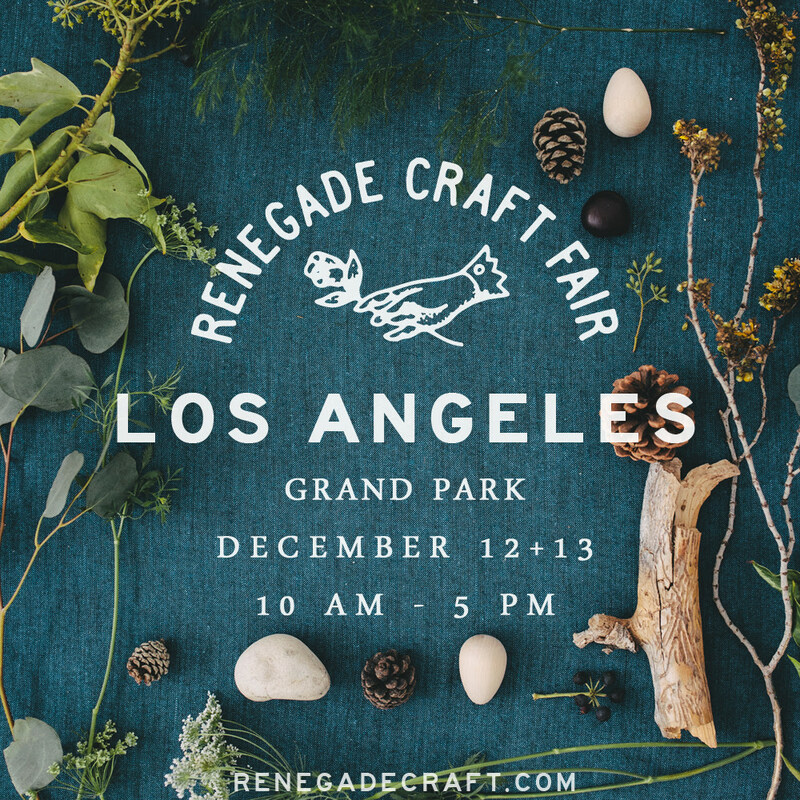 Add #RenegadeCraftFair and #RenegadeLA to your RCF-related Instagram pictures and tweets! We love seeing what our followers and makers are up to! For more information about this event, please visit the Renegade Craft Fair website, check out our upcoming Maker Spotlights, or browse the Makers on Pinterest. Pasadena will soon be home to a new 1300 capacity theater. Scheduled to open February 2016, the new venue located in the location previously occupied by Gelson’s will be known as the The Rose Theater. Lance Sterling, of Sterling Venue Ventures. The Rose and will enable local residents to hear well-known rock and country musicians without traveling to Los Angeles. Larger more established acts may not perform at The Rose, but could perhaps do smaller shows. The 39,000 sq ft space has been upgraded with state of the art sound and lighting costing some $3 million. There will be VIP areas as well as two bars. With other developments taking place at the Paseo, this is a welcome development to bring more people to the downtown area of Pasadena. Burke Farrar of Pasadena-based Odyssey Development Services, who is assisting Sterling with city approvals and permitting. Sterling is leasing the property from DDR Corp., the company that owns and manages the Paseo Colorado. Gelson’s market closed in 2013. The first scheduled concert will be Judy Collins on February 14, 2016. Tickets to this and future shows will be available on Ticketmaster. These are just the some of the acts booked now. Revenue from ticket sales pays the performing musicians, Farrar said The Rose will rely on restaurant and alcohol sales to cover its other expenses. The developer Mr. Sterling owns and operates The Canyon in Agoura Hills as well as The Saban in Beverly Hills. In terms of food options at The Rose, look for a new franchise of CaliBurger which Sterling purchased, one for each of his properties as well as the full kitchen which will offer a wide variety of items, including steaks, etc. You can see the types of shows The Rose will host, by taking a look at the other theaters. The Saban • 8440 Wilshire Blvd. The Rose Dinner Theater, “where music meets the soul”, see the types of performances which are already booked on Ticketmaster. The Arroyo Verde (Green Arroyo) Awards are the most prestiguous local environmental awards. The awards recognize those who have made a valuable contribution to protecting and improving the Arroyo Seco watershed and our local communities during the past year. 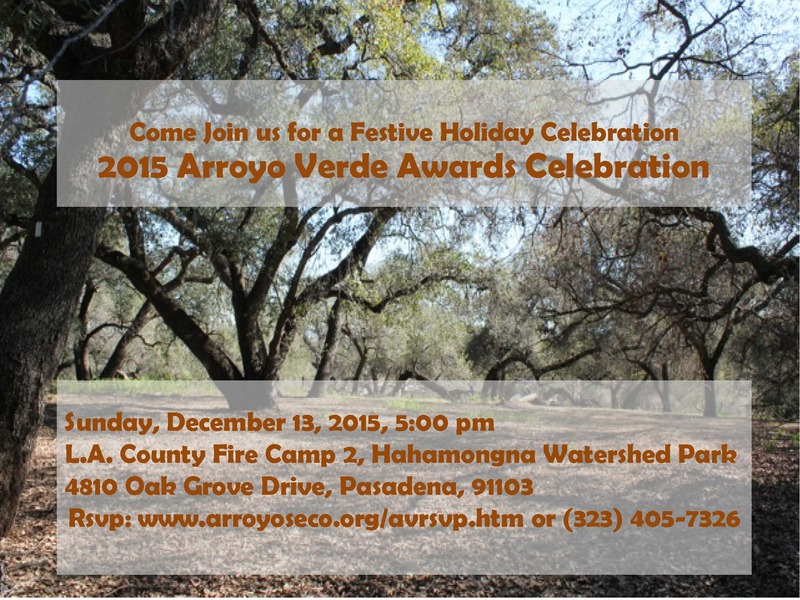 The 2015 Arroyo Verde Awards will be presented at a festive holiday gathering sponsored by the Arroyo Seco Foundation and the Council of Arroyo Seco Organizations (CASO) at LA County Fire Camp #2 in the far northwest corner of Hahamongna Watershed Park, just south of Jet Propulsion Laboratory. Please join us to celebrate nature and our local heroes. Refreshments and networking begin at 5:00 pm. The awards ceremony will begin at 5:30 pm. UNA Pasadena with your ticket. You can also RSVP via Facebook by clicking HERE. 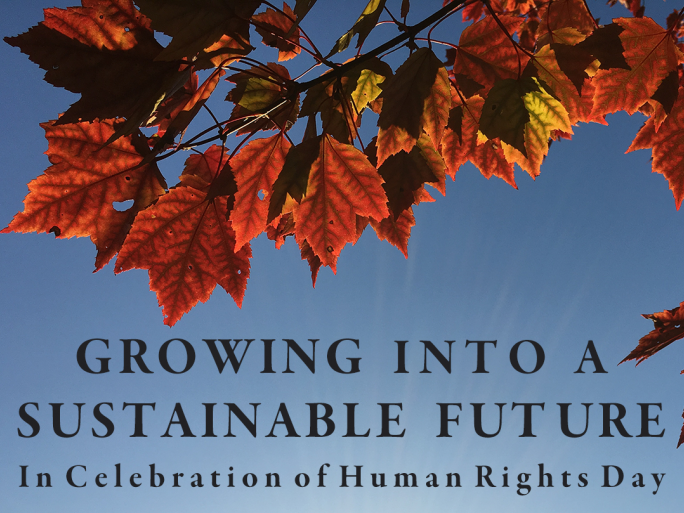 celebrate the 67th anniversary of the Universal Declaration of Human Rights! An estimated 12 million trees across California have died in the past year. Come learn what impact this has on local climate and what Australia did during their 10-year drought. Find out how you can not only lower your power and water expenses, but also make a difference to build a sustainable future for your community. This event is FREE for the public. City Council Districts Good or Bad? I am torn on the issue of cities having council districts as opposed to having council members representing all residents. On one hand it seems to be a way to provide local neighborhood residents a voice and support. On the other hand it seems to be divisive in separating neighborhoods, or having council members feel that if a resident is not in their district why should they help them. I am sure we will hear more about this. Pasadena has seven council districts. Voters in Pasadena vote for council member to represent their district. The elected council member must live in the district they “serve”. Burbank and Glendale have no districting. Is this something that should be revisited, and why is it that cities of comparable size and neighboring do not have districts? Adorn yourself with your favorite accessories and join us for a fashionable community free day with complimentary hot chocolate courtesy of Caffe D’Amore and live holiday music by the Ad Hoc Consort. Release your own creativity as you make clay ornaments inspired by changing fashions at an Art2Go workshop – fun for all ages! View the Fabulous Fashion exhibition and the Edwardian holiday decorations in the Fenyes Mansion. Tour the Finnish Folk Art Museum. All are invited to be a Member-for-the-Day with free admission and a 20% discount in the Museum Store, where Pasadena favorites will be available for purchase to delight your friends and family this holiday season. Tickets: Free, no reservations required. Norovirus suspected at Chipotle visited by 80 sick Boston College Students. Chipotle already dealing with e. coli breakouts. Not the best you can get for $99. Will not get you to a full charge. Battery level of case can be seen on screen. Tiny led light inside the case. You can’t control like the mophie. If you watched or attended the Pasadena Public Safety meeting held Dec 7, 2015 started around 5:30pm and was done at nearly midnight. At least two dozen speakers waited to speak until 10pm to express support for Pasadena Police and Chief Sanchez, but just as many raised questions and were critical of the council members, safety committee, City Manager Michael Beck and Police Chief Sanchez faced a barrage of questions from councilmembers and members of the public. This is some of the video where tensions between Councilmember Hampton and Councilmember Madison. Councilmember Hampton responding to Councilmember Madison regarding some of his comments and they way he was addressed. Several including councilmember Hampton repeatedly questioned the intent of the OIR report to be released to the public in its entirety, but at the same time City Manager Beck and Police Chief Sanchez, explained that the scope of the agreement with the OIR Group, who wrote the report had a specific direction to provide recommendations, that the details of the event was not the primary focus. Councilmember Kennedy, Chair of the Public Safety Committee read the contract which is public. We have requested the agreement. It is The OIR report was released with redactions proposed by the city and approved by LA County Superior Court Judge James C. Chalfant. In 2009 there was a deadly shooting in Pasadena, with a OIR report being written by the same OIR Group which authored the McDade OIR report. With the Barnes shooting report, there was no redactions and there is controversy as to wether or not it was “accidentally” released to the public by then Pasadena Police Chief Melikian. Officers (Matthew) Griffin and (Jeffrey) Newlen received no disciplinary action as a result of their actions. In 2009, Pasadena Police Chief and President of the CA Police Chiefs Association Bernard Melekian discusses the impacts to public safety if the state borrows local government funding. The first OFFICIAL Biblibules Live Event will take place December 12, 2015 in Pasadena, California for any book lover. **Since we have a young adult author, any attendee who is under the age of 21 MUST BE accompanied by an adult (21+ in age) since there will be alcohol served at the venue. During the event, you’ll be able to buy and/or have your books signed by the authors, receive free gifts and swag, mingle with fellow book lovers while having drinks and snacks as music plays so you can dance, giveaways of books and other items and so much more. Only 200 tickets are available, so hurry up and get your tickets now. There is a $20 early bird special on all tickets through EventBrite ($30 at the door); only 30 tickets to be a Bibliobules Support for $75 that gets you special access and gifts (reg. $100). Attendees must be 17+ years of age and anyone under the age of 21 must be accompanied by an adult (21+ in age). There is public parking structures nearby (within walking distance) as well as the Memorial Park Station (Metro Goldline) just one block from the event. Dress your best – it is a party. You may bring your cell phones for communication and any camera type of device to take pictures. Please do not bring outside promotional materials. You can contact us on FB, TW, IG or our website. If you are unable to attend the event, you may offer them to another person who is at least 21+ years old. PLEASE contact Bibliobules immediately so we can mark our attendee list with their name. You can update your registraiton information at any time here on Eventrbrite. 3 days of celebration in the heart of Pasadena leading up to the Rose Parade and Rose Bowl Game. Pasadena Councilmember Steve Madison Presents a Community Forum: Are You Prepared for El Niño 2016? 18 years since the last El Nino. From a super drought to a godzilla El Nino. Last 4 years less than 30 inches of rain, driest 4 years in recent history. Chief Sanchez will be presenting and reporting. The public is welcomed to comment during the open comment session. Recommendation: This report is for information only, no action by the Public Safety Committee or the City Council is requested at this time. PASADENA, Calif. —The Iowa Hawkeyes are headed to Pasadena to play in the Rose Bowl for the first time since 1991. Kirk Ferentz’s outfit will square off with Stanford Cardinal, the Pac-12 champions, in the 2015 installment of the historic Rose Bowl game. The game is scheduled to kick off at 4 p.m. CT and will be televised by ESPN. Additional tickets for the Rose Bowl Game presented by Northwestern Mutual will go on sale this Tuesday, December 8 at 8 a.m. PT/11 a.m. ET. Tickets will be available online at www.ticketmaster.com or by calling Ticketmaster at 1-800-653-8000.